Well-connected sources have revealed that Maricopa County Attorney Andrew Thomas is expected to seek the post of Arizona Attorney General in 2010. Thomas was the Republican nominee in the 2002 Election cycle. Arizona Superintendent of Public Instruction, Tom Horne, has already formed an exploratory committee to seek the post. Janet sent Nelson to run against Thomas, and it was a complete failure. Nelson is a smart guy who had appeal and ran a well-funded campaign, and harped on just a couple issues and tried to exploit every misstep and piece of trivial junk he could. He got absolutely nowhere. They all thought he would trounce Thomas. I can’t believe they’re going to get up and try that again. Actually, the main Dem AG candidate probably won’t be Burke. It will be someone who can’t announce yet due to resign-to-run. Burke is rumored to be eyeing a U.S. Attorney slot. Personally, I’d like to see Gerald Richard go for it, but I don’t think that’s going to happen yet. 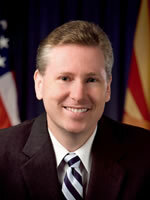 Of course, if Thomas actually does go for AG, Richard may take another shot at Maricopa County Attorney in two years. If Thomas does run for attorney general, I would expect Bill Montgomery to run for that position. He could easily beat Richard in heavily Republican Maricopa County, especially considering Richard’ strong pro-amnesty position he ran on for county attorney. Andy would be great — a state AG who puts the law above partisan politics is a refreshing change. Andy has done a terrific job. Isn’t this a pay cut? Montgomery as Maricopa County Attorney and Thomas as AG would set up the Republican Party for a couple of election cycles with strong candidates in key positions. Question, wouldn’t Thomas have to resign to run? Montgomery could then be appointed and run as an incumbent while backing Thomas in his run for AG. Sounds like something smart for Republicans to do. If Thomas resigns, look for Kyl and McCain to break arms to get their boy Pacheco appointed to the seat he couldn’t win for himself. Andy will get TROUNCED if he runs again for AG. The Dems will HAMMER him on his involvement with trying to prosecute the guys from the New Times. They’d also be smart to hammer him on his opposition to Miranda rights. Granted, the little fascist is correct that the Miranda decision is wholly made up of dicta from the Justices with no basis in the Constitution whatsoever, but I think it’s a needed piece of case law (mark this as the one of the very few times I will EVER favor judicial activism). His nutty advocacy for the destruction of Miranda rights will not sit well with the public at-large. Mark my words: Andy lost before, and he’ll lose again if he’s the nominee. AF: The Dems did just try to hammer him on that and they hit their thumb instead. Had there not just been an election you might have a point, but tell us how the electorate we saw last month is going to change their minds over the next two years? Well, the “electorate” that voted for the Maricopa County Attorney is not the only electorate that votes for the Arizona Attorney General . . .
Thomas would have to win Maricopa big (not to say that he won’t) in order to make up for Tucson and Flagstaff. I’ll answer that question. Yavapai County. Wooden Teeth – you can’t persuade people like Antifederalist, they have an ax to grind and reason and facts aren’t going to persuade them. Thomas won reelection easily by an 8-point margin, trouncing the governor’s candidate. The voters rejected the nonsense Antifederalist is talking about. The Democrats already tried to hammer Thomas on the New Times subpoenas and didn’t get anywhere, probably because they couldn’t even get their facts straight, the subpoenas were ordered by the Sheriff’s Office, not Thomas. Don’t see how they will have any luck bringing up this issue again in the future when it’s already been firmly rejected by the voters as an issue. Antifederalist is right on this one. State AG race will get more media coverage and the more voters get to know Andy and his believes the less they are going to like him, just like they did last time. “Maricopa County Attorney Andrew Thomas has instructed the treasurer and top county officials not to pay the fees of private attorneys hired by the Board of Supervisors. Thomas also warned that each could be held personally liable for recovery of the money. The Board of Supervisors on Dec. 5 voted to have outside attorneys investigate whether Thomas should stop providing legal advice to the board on civil matters while prosecuting Supervisor Don Stapley in criminal court. The county is working with at least three private attorneys, said Jim Bloom, chief of staff to Supervisor Andy Kunasek; the county has not yet been billed for their work. Thomas has denounced the decision to hire the attorneys as illegal, and therefore, “any expenditures pursuant to this alleged authorization would be unlawful,” he wrote in a one-page letter the officials late Monday. Chief Financial Officer Tom Manos, who pays the county’s bills, said he is trying to figure out how to proceed. Treasurer Charles Hos Hoskins, who is essentially the county’s banker and has had a series of conflicts with the Supervisors, told The Republic he would the heed the advice. It is unclear if he could prevent the finance department from paying the bills. Deputy County Manager Sandi Wilson did not return calls for comment, and County Manager David Smith is out of the office on medical leave. Stapley is charged with 118 counts related to the financial disclosure forms he had filed with the state over the 14 years he has been in office. We need to recall this reckless man. Take the political biase out of the picture and look for someone who will put the state first and his/her agenda second. Just because you could be democratic or republican, make you a good fit. There may a good Liberterian or member of the Green Party who could do a better job. The Green’s candidate who ran in Pima County for their county attorney would be a better fit than thomas any day of the week. Thomas’s feeling get in the way to do any job he want to do and for the good of Maricopa County: he should resign now. I really came across this on Google, and I am really happy I did. I will definately be returning here more generally. Wish I could add for the post and bring a bit much more for the table, but am just absorbing as much info as I can at the moment.